We are dedicated to providing open source map data for mobile devices at minimal cost and available for use offline, i.e. when you have no connection to the internet. 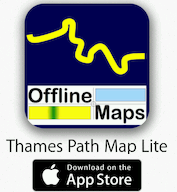 Offline maps are great - you have the map on your mobile device at all times. You do not need a connection to the internet. Your battery life is greatly extended - they even work in "airplane" mode! You don't have to rely on service provider coverage. With KML/KMZ files you have Points of Interest files you can use/search offline to enhance your local knowledge. Once you start using them you'll wonder how you managed without them! Our other maps are currently only available within the Avenza Inc. Avenza Maps App. The App is available on both Android and Apple platforms, is free of charge, and maps are downloaded through the App itself. Use the links on the right hand side to find out more information and download the appropriate App. Most of our maps are free of charge or priced at the minimum pricing tier. In addition to the GeoTiff map data we also provide point and line features within KML/KMZ files to locate key points of interest on our maps. If we don't have the map you want - LET US KNOW AND WE WILL CREATE IT FOR YOU - USUALLY IN LESS THAN A WEEK. Include your email address and you will receive a link to download a free copy of the map.